The Young Master (Neil Mulholland) is all set for the £1-million Randox Health Grand National, staged at Aintree Racecourse on Saturday, April 8, 2017. The Randox Health Grand National, which has 78 entries going forward, is run over four miles, two furlongs and 74 yards and 30 fences. The maximum permitted field is 40. The Young Master enjoyed the finest moment of his career so far when the short-head winner of the valuable G3 bet365 Gold Cup at Sandown Park in April, 2016. The eight-year-old was last seen out when a staying-on sixth, beaten 21 lengths, in the G3 Ultima Handicap Chase at the Cheltenham Festival on March 14. He is a 20/1 chance with Betway, official betting partner of the Randox Health Grand National Festival. Amateur rider Sam Waley-Cohen is set to take the ride again on The Young Master in the Randox Health Grand National, which is due off at 5.15pm on April 8. Waley-Cohen boasts a tremendous record over the Grand National fences, having six victories courtesy of Katarino (2005 and 2006 Randox Health Fox Hunters' Chase), Liberthine (2006 Randox Health Topham Chase), Warne (2014 Randox Health Fox Hunters' Chase), Oscar Time (2014 Betfred Becher Chase) and Rajdhani Express (2015 Randox Health Topham Chase). In seven rides in the Randox Heath Grand National itself, the top amateur rider achieved his best finishing positions on Oscar Time, who was runner-up to Ballabriggs in 2011 and fourth in 2013. Sam's father, Robert Waley-Cohen, owns The Young Master in partnership with Sir Martin and Steve Broughton. 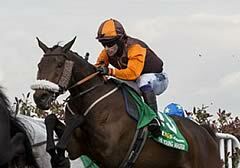 They bought 50 per cent of the horse earlier this year from Mike Burbidge, who retains the other half-share in the Neil Mulholland-trained chaser. Robert Waley-Cohen said today: "The Young Master seems to have come out of his race at Cheltenham very well and it's all systems go for Aintree. "We would have preferred it if he had finished third at Cheltenham, as he did last season, but his run was fine. "He seems to be a spring horse and runs well at this time of year, so hopefully that will continue at Aintree. "You hardly dare say that Sam has a great record over the fences as one day it is going to catch up with you with a fall! He has had a couple of falls over the fences and some great wins too. "The horse's weight (10st 12lb) is exactly where I expected it to be - I have no arguments with his rating. In a race like the Randox Health Grand National, with 40 runners, you only need some minor interference for a pound or two to make no difference at all." The last Randox Health Grand National winner to have run in the Ultima Handicap Chase before winning at Aintree was Bindaree, who was seventh at Cheltenham before his famous success in 2002.